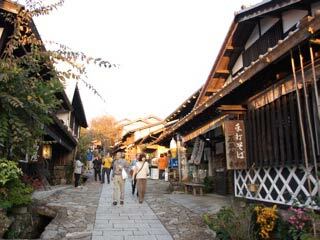 Magome Juku (馬籠宿) is a old post town of nakasendo road located Nakatsugawa, Gifu. It was 43rd post town from Edo. This post town remains and reconstructed the old look of Edo style post town, and one of the popular tourist spot in Gifu, today. The houses are built in Edo style and the stone road are remains from the Edo period. There are lots of gift shops, food stands, museums and even hotels. Magome Juku was 43rd post town out of 69 on Nakasendo road. There were 18 Inns, stables, and restaurants.